Habit: Annual, glabrous or sparsely strigose. Stem: ascending to erect, 0.5--4 dm. Leaf: irregularly pinnate to palmate; stipules gland-like or 0; leaflets 3--5, 4--12 mm, elliptic to obovate; axis sometimes +- flat, blade-like. Inflorescence: axillary, 1-flowered, peduncle 0 or 1--5 mm, bracted. Flower: calyx 1.5--2.5 mm, lobes +- = tube, glabrous; corolla 4--6 mm, not opening, pink or salmon, quickly fading, wings +- = keel; stigma glabrous. Fruit: dehiscent, erect or divergent, exserted, 1.5--2.5 cm, oblong, straight, flat, often wavy-margined, glabrous; beak +- curved, 0.5--1.5 mm. Seed: (3)5--9. 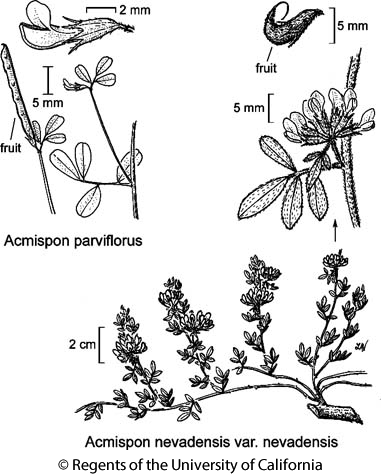 Citation for this treatment: Luc Brouillet 2012, Acmispon parviflorus, in Jepson Flora Project (eds.) Jepson eFlora, http://ucjeps.berkeley.edu/eflora/eflora_display.php?tid=91717, accessed on April 24, 2019. NW, CaR, n&c SN, s SNF, ScV, CW, SCo, n ChI, TR, PR; Markers link to CCH specimen records. Yellow markers indicate records that may provide evidence for eFlora range revision or may have georeferencing or identification issues. Purple markers indicate specimens collected from a garden, greenhouse, or other non-wild location.